The beautiful Rose Garden at Coughton Court has 200 varieties of roses. 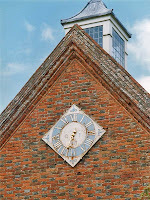 The best time to visit is in the last week of June or first week in July. 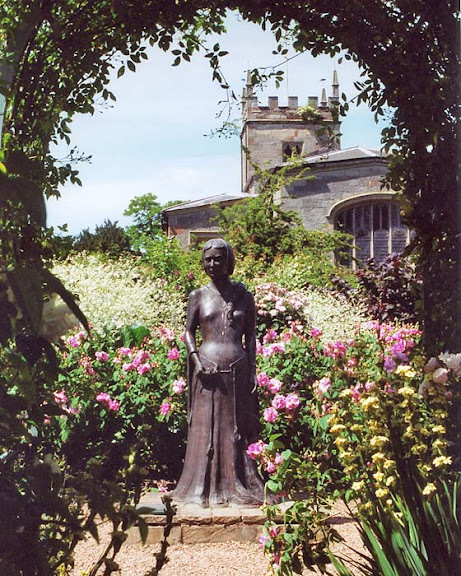 The centrepiece of the rose garden is a statue of Rosamund, lover of King Henry II. She is surrounded by a bed of rose 'Rosa Mundi'. This rose is named after her. 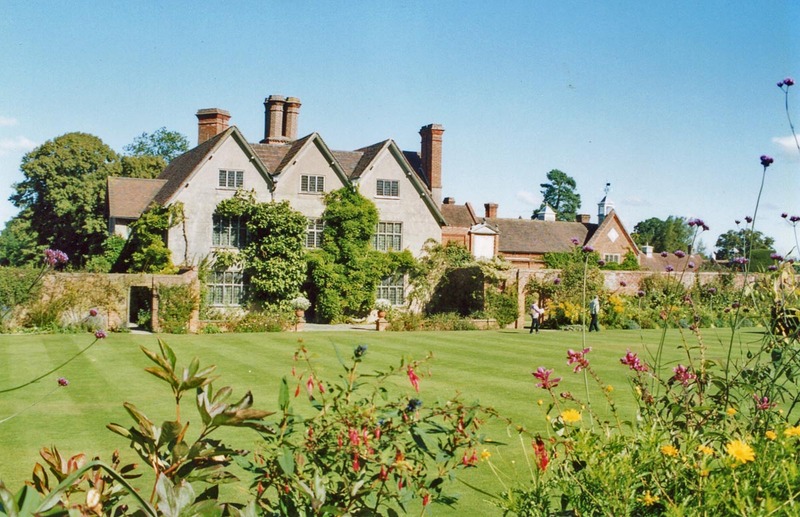 Packwood House, in Warwickshire, is a garden with a message. 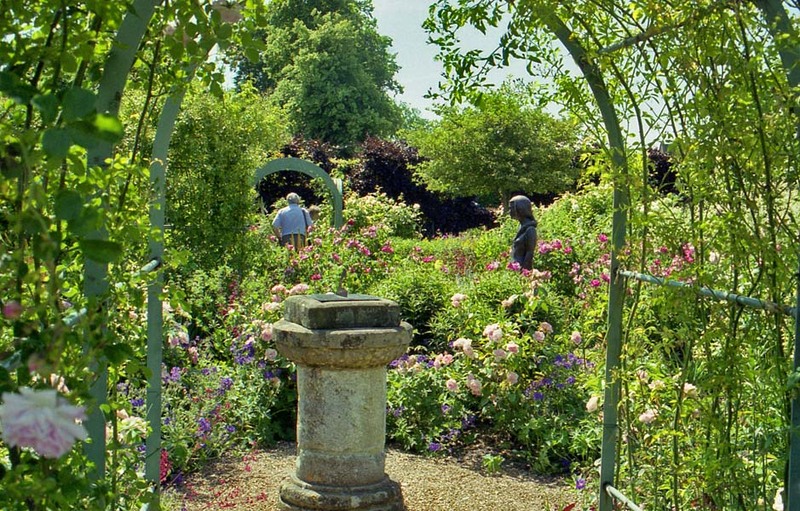 Described by Roy Strong as "capturing the atmosphere of religious emblematic horticulture". The garden has some conventional herbaceaous borders, and an attractive sunken garden. 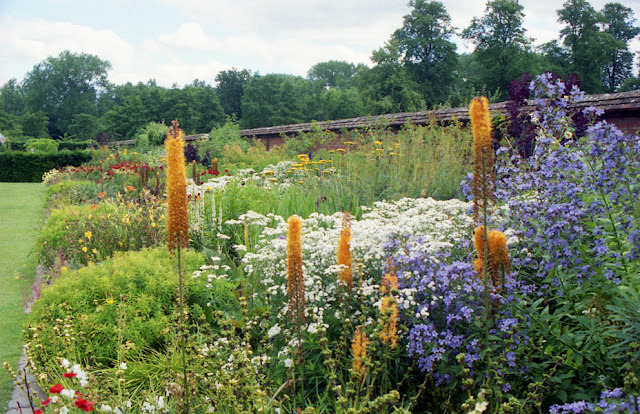 Most of these photos were taken at the end of the season and don't do the garden justice. This garden is very near to me, so I will revisit during this season, and get some far better photos. 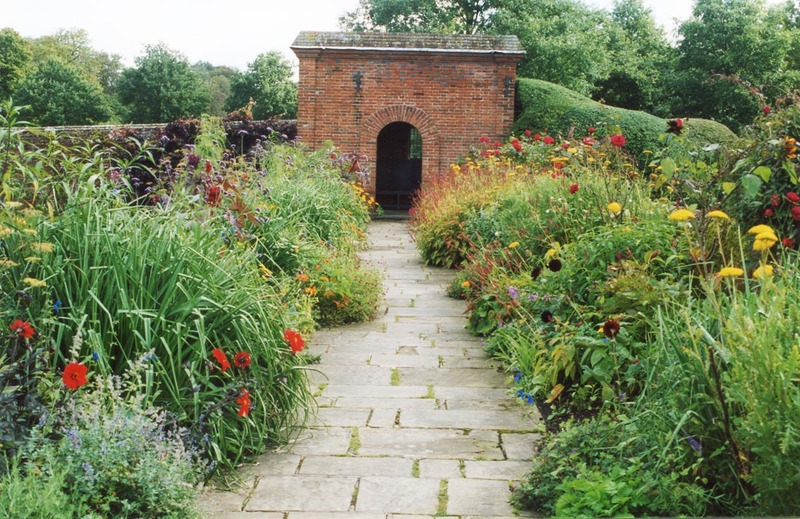 This photo shows the sunken garden, which looks at its best in the Spring. 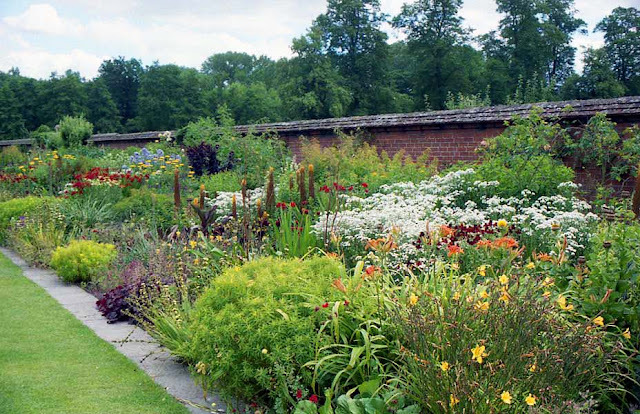 This feature is called the Terrace Walk. You can see that the plants are getting a bit tired and ragged towards the end of the season. The photo enlarges if you want a closer look. 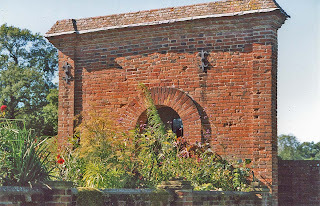 There's a lot of nice brickwork around the garden. Now we get to the novelties. 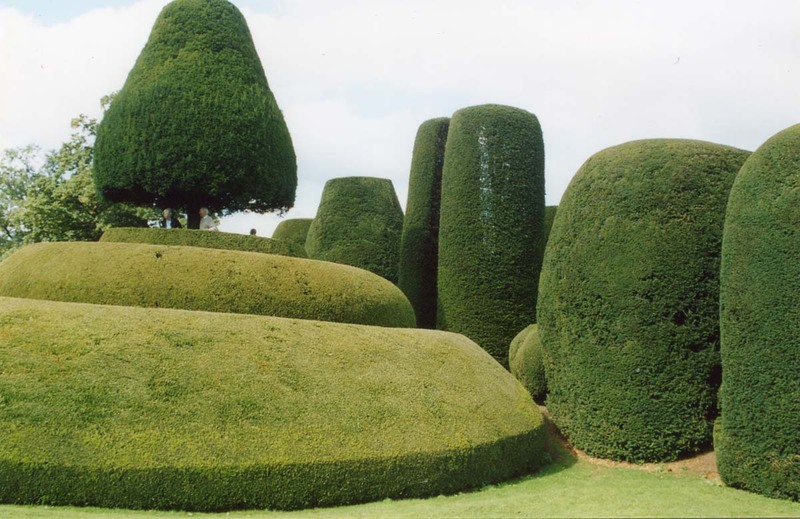 The first unusual feature of this garden is a garden of yew trees. 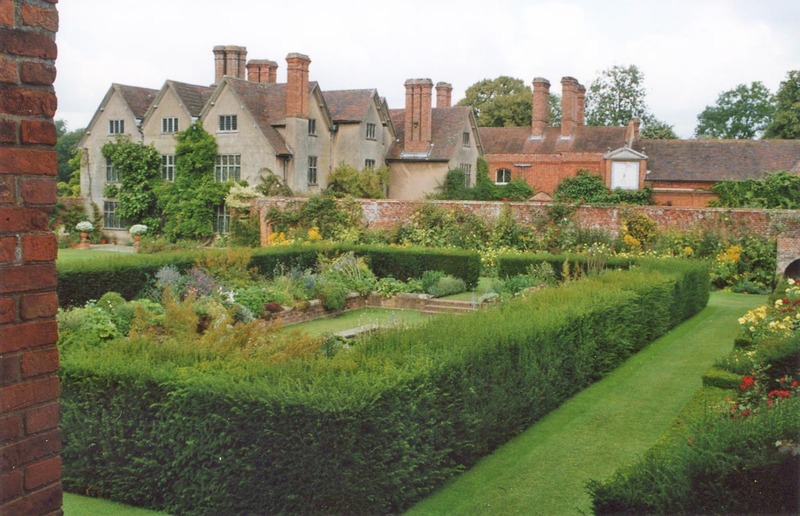 The yew garden was originally laid out around 1660. A spiral walkway, which climbs up to a solitary yew. 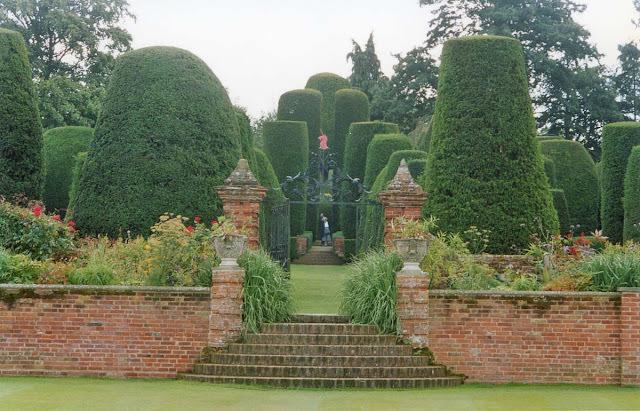 If you enlarge the photo you can see two figures standing at the top of the walkway, beneath the solitary conical yew. The entire yew garden is said to represent the Sermon on the Mount. 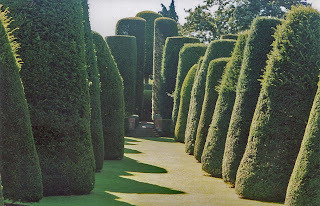 The avenue of yews represents the Apostles, and the single yew is referred to as The Master. 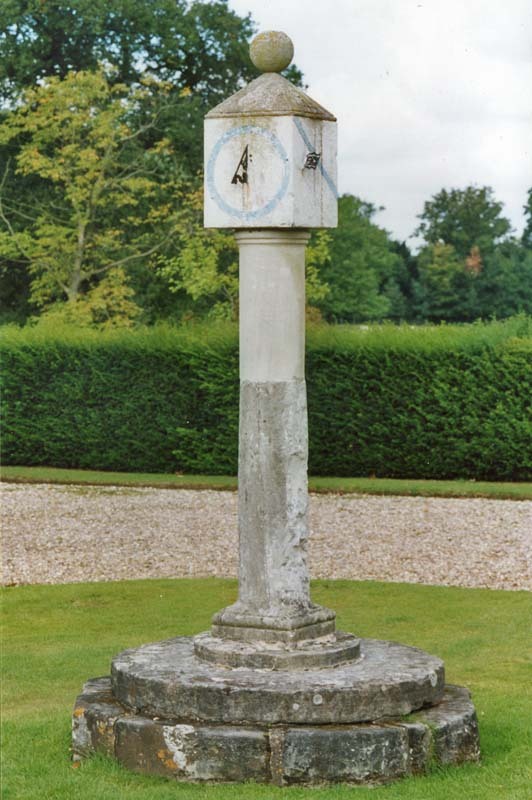 Like the Yew garden, this collection of time-keeping devices is inviting us to consider something, about time and eternity. 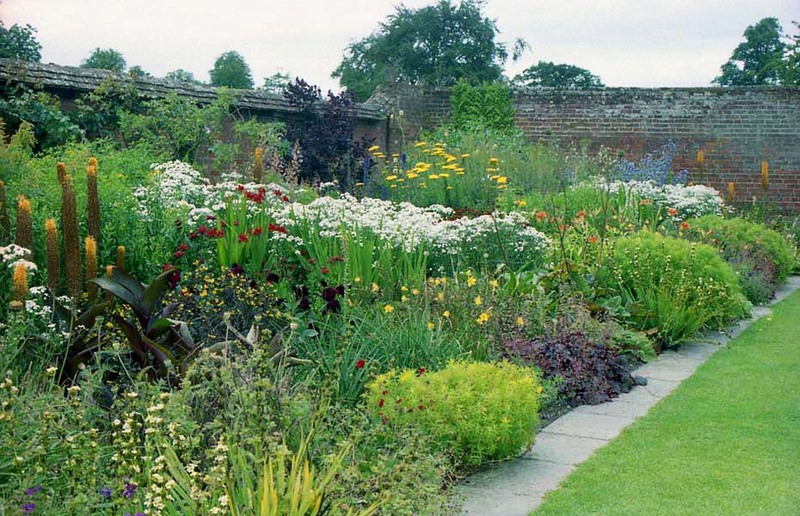 This is a garden which is more than an arrangement of plants. It invites the visitor to engage their minds with the garden and to think about things. "What the garden [in general] spoke about most powerfully of all was time. 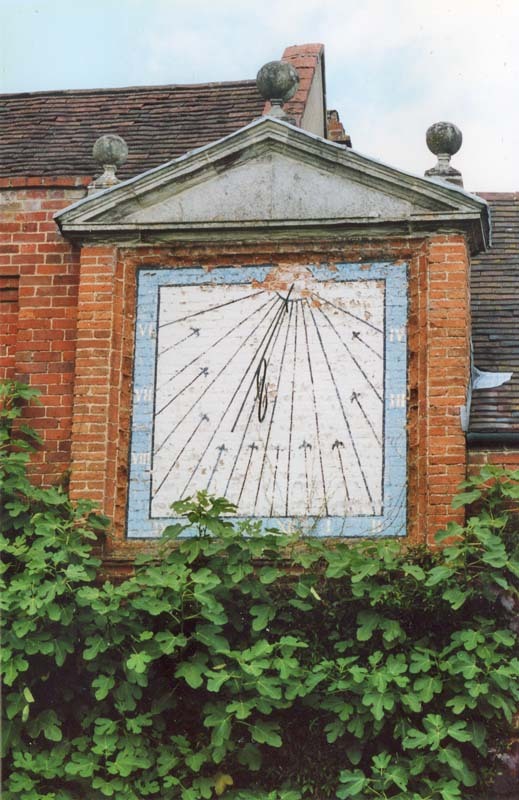 And the object which precipitated these darks thoughts was the sun-dial. Cupid and the Faithful Soul standing within the hortus conclusus point to it. The garden with its cycle of seasons of death and resurrection was a perpetual reminder of life. One garden which is full of this symbolism and which still survives is Packwood House, Warwickshire. 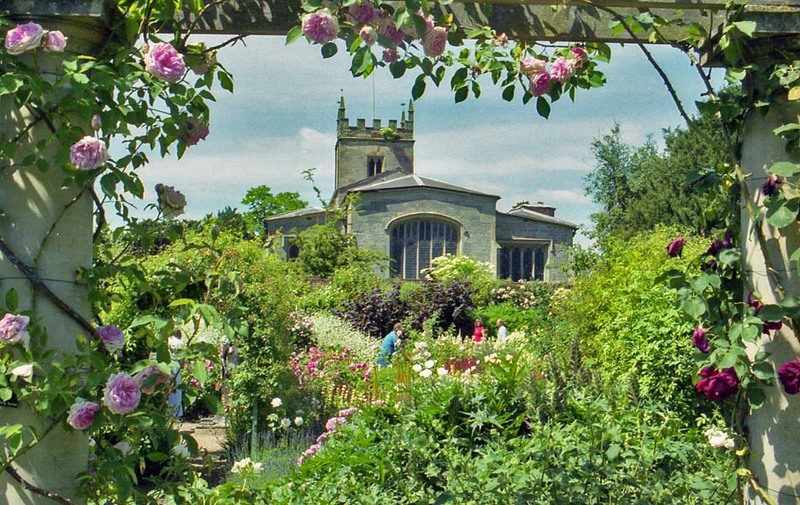 In the absence of any other surviving instance this re-creation seems to capture the atmosphere of this type of religious emblematic horticulture". 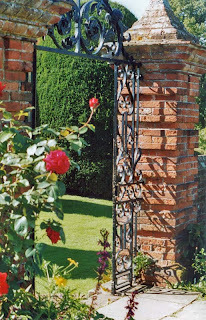 The entrance to the property is also unique. Originally, the approach to the property passed along an avenue of oak trees, a mile long. 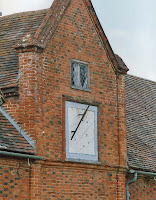 The modern road entrance uses a different route, so most visitors today do not normally see the house from this viewpoint. The phrase 'A Thinking Man's Garden' is probably worth a post in itself. 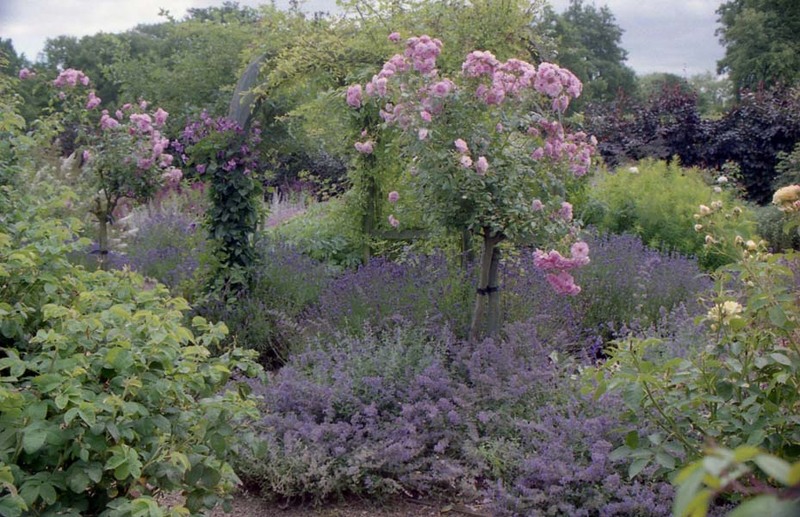 On the whole I do think that a man's perception of a garden is different to a woman's. 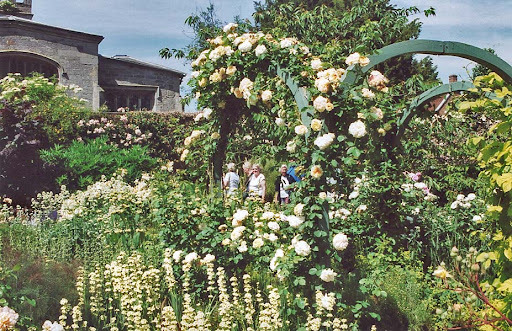 The woman's perception inclines more towards experiencing the garden in terms of senses rather than thought. Though having not been born inside a woman's body I don't know what it's like to experience a garden as woman do. 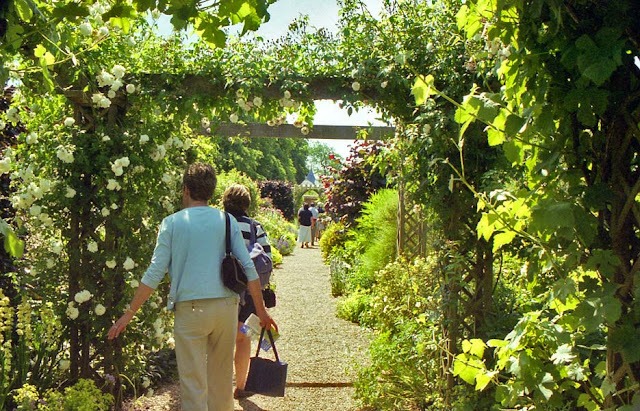 I have to use my feeble brain to think about gardens instead. 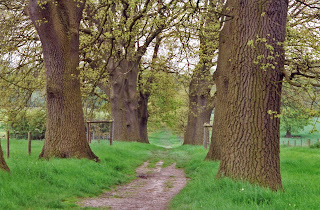 The part of Warwickshire North-West of the river Avon was the old Forest of Arden. 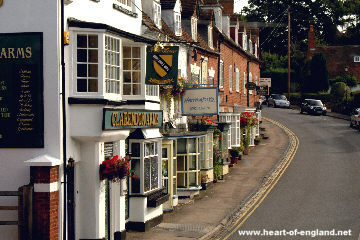 The name still occurs in the several place names in the region: Hampton-in-Arden and Henley-in-Arden. Much of the Forest of Arden was cleared during the Middle Ages, and some of it earlier. 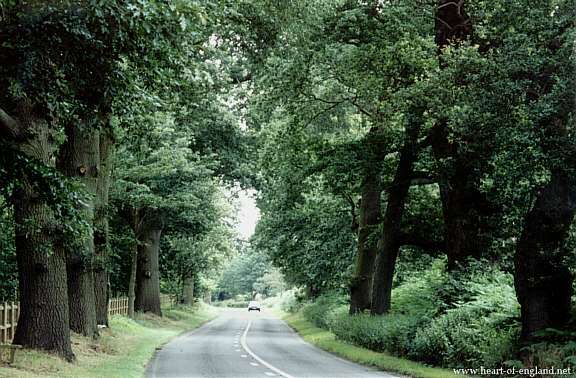 By the time of Domesday, 1086, about 35% of North West Warwickshire is known to have been wooded. Despite clearance, the entire area today still retains a wooded character. 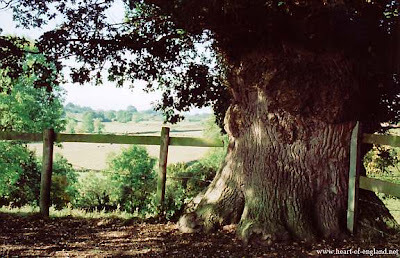 Everywhere can be seen oak trees, in small copses, in hedgerows, or marking places where hedgerows have been. Some useful evidence comes to us in the form of Anglo-Saxon place names. The names of many villages in the Arden area end with "ley" or "leigh", a Saxon suffix meaning "woodland clearing", and these settlements may have been cleared in Saxon times. 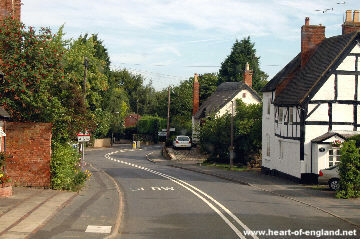 There are some 85 such place names in Warwickshire, almost all within the Forest of Arden area. The name is rare in Warwickshire outside the Arden region (only 4 occurences outside). 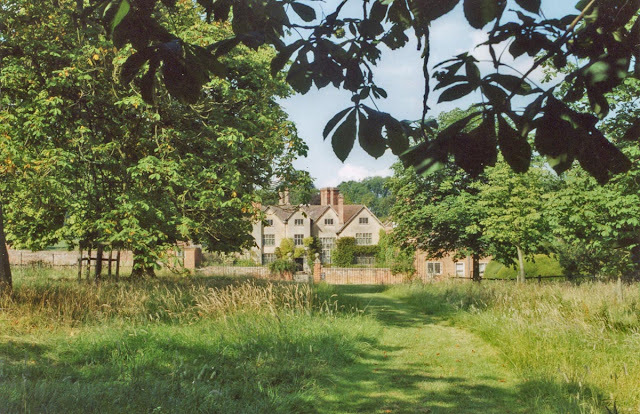 Allesley, Ansley (hermitage in a leah), Aspley (aspen leah), Astley (eastern leah), Baddesley-Clinton (leah owned by Clinton), Baddesley-Ensor (leah owned by Ednesouere), Bentley (bent grass leah), Birchley (birch leah), Botley (bot=firewood), Canley, Corley (cranes forest), Crackley, Darley (deer leah), Fillongley, Haseley (hazel leah), Henley (high leah), Honiley (honey leah), Ipsley (leah on a hill), Keresley, Kingley, Knightley, Langley (long leah), Oakley (oak wood), Pinley (pinn=slope), Pooley (pool leah), Ragley (rag=moss leah), Ratley (rot=merry), Saltley (sallow=willow), Shelley (leah on slope), Shirley (shire leah, where a moot is held), Shrewley (sheriff's leah), Stoneleigh (stony leah), Studley (pasture for horses), Tackley (tack=sheep), Walmley (warm leah), Waverley (waver=brushwood), Whitley (white leah), Willey (willow leah), Windley (winn=meadow). Such place names are evident in the three photos above, which were taken at Crack-ley, Stone-leigh, and Baddes-ley. And also in the photo right, taken near Hen-ley. Virtually no Roman roads cross the region. It has been suggested that this was due to the difficulty of building roads through woodland. The dominant tree in the Arden area of Warwickshire is oak. In some villages approximately 90% of the large trees are oaks. The subsoil here is a generally a heavy deep clay. Digging a small hole, after about 9 inches down will hit clay, which is what oaks like, and many other trees don't. This heavy clay soil is less favourable to agriculture and so was less susceptible to being cleared for farmland. 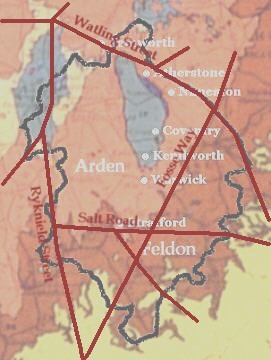 The Arden area is effectively bounded by Roman roads (shown in red on this map), the Fosse Way on the East side, and the Salt Road along the Southern boundary. The area of the Forest of Arden correlates with an area of underlying Mercia Mudstone (shown in light brown) and Carboniferous Sandstones (grey). Sherwood Forest lies 40 miles to the North, on the same band of Mercia Mudstone, which forms a narrow arc across England. The contrasting area of Warwickshire South-East of the Avon consists of much more open countryside. This overlays a band of Jurassic Lias Clay soils (shown in dark brown). In contrast to the Arden, the South-East area of Warwickshire is traditionally known as Feldon. The historian Dugdale speaks of the Avon dividing the "wooded part" from the Feldon. 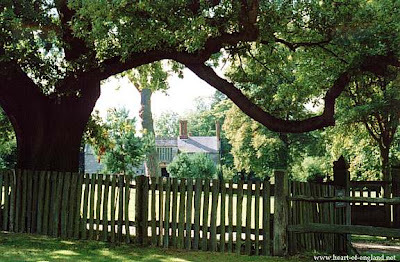 The Forest of Arden is the setting for Shakespeare's play As You Like It. Besides the Forest of Arden in Warwickshire, there are two similary named woodlands in France. Shakespeare's play is an adaption of an earlier story written by Thomas Lodge, which was originally set in one of the French woodlands. 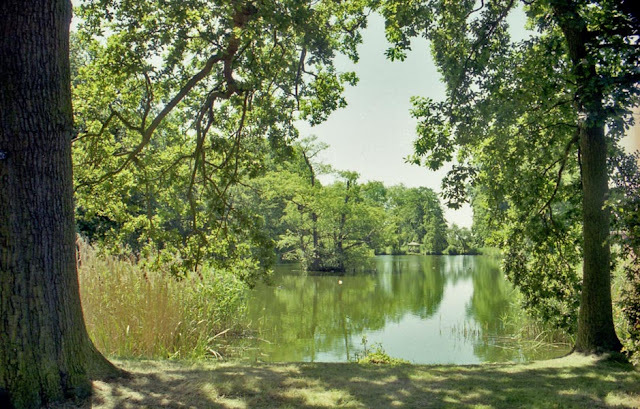 By a coincidence Arden also happened to be the name of the woodland around Shakespeare's home, and also, by another coincidence Arden was the maiden name of Shakespeare's mother. In Shakespeare's mind the woodland imagary would have come from his local wood. 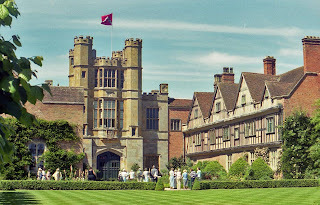 Shakespeare seems to have compared Arden with the Biblical Eden. The idylic ife inside the forest contrasts with the "fallen" world outside the forest. There are several allusions to the Biblical story in the play. The Forest is a magical place, where strange coincidences occur, strange apparitions appear, and where people are transformed through self-discovery, or by finding love. 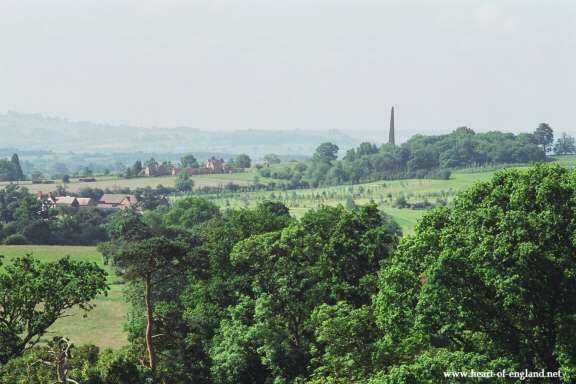 In 1989, the UK Countryside Commision were investigating the possibility of creating a new National Forest. The combined local authorities of the Warwickshire area proposed a plan to regenerate the Forest of Arden. 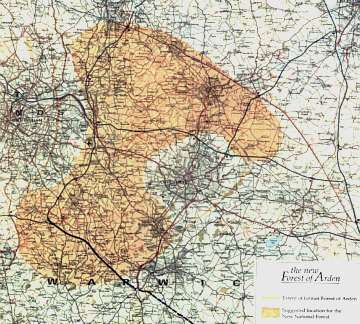 This map, from their proposal document, shows the proposed area of the new forest. This would have been similar to the area of the original forest, with the exceptions that the City of Coventry, and the Eastern perimeter of Birmingham, which did lie within the old forest, would have been excluded from the new forest. The new forest would not have extended South beyond Warwick. This is not a plan to introduce wall-to-wall forest, but to increase the proportion of land under woodland. The plan would have involved planting 150 million trees, including a high proportion of oak, in the area. For various political and economic reasons, no progress has been made to accomplish this. 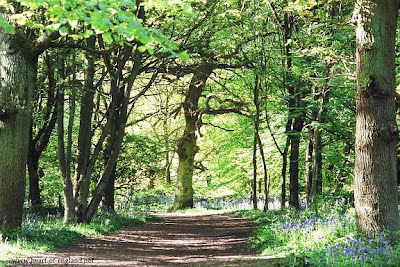 There are 32 species of native British trees: alder, crab apple, ash, aspen, beech, birch (2 species), box, wild cherry (2), elm, hawthorn (2), hazel, holly, hornbeam, juniper, lime (2), maple, oak (2), scots pine, poplar, rowan, service tree, whitebeam, willow (4) and yew. The ecological values of trees can be measured by the number of different insects they host. Oak hosts 284 species; followed by willow (266); birch (229) and blackthorn (149). Sweet and horse chestnuts are popular as specimen trees on village greens in Warwickshire, but are foreign imports. Horse chestnut was introduced, in the 16th century from Turkey, and only hosts 4 insects. 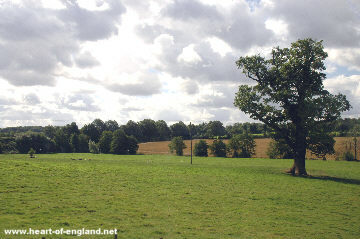 The dominant tree in the Arden area of Warwickshire is oak. Silver birch is common (the 2nd most common tree in English woodlands) and grows very quickly. Ground left open here will first be covered by bramble and birch, and then, as oak grows up through and over it, the oak takes over. Elm used to be common in Warwickshire hedgerows, but was mainly wiped out by Dutch Elm disease about 10 years ago. During the last ice age, 12,000 years ago, there were no trees at all across England. At the end of the ice age, trees began to move northwards from Southern Europe. 5,000 years ago, England was largely covered by wildwood. Pollen analysis shows that the commonest tree, throughout central and southern England was the lime. Much of the extensive natural woodland covering of England was cleared in pre-Roman times. 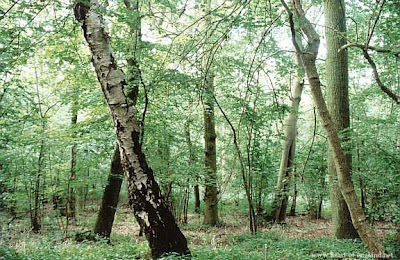 By the time of the Norman Conquest only around 15% of England remained wooded. Substantial areas of woodland remained in Warwickshire and Middlesex. These pre-Norman woodlands were not deserted wall-to-wall-forest, but contained within them clearings, natural and man-made, and thriving communities, raising pigs and other livestock, and sustainable harvesting of timber for building and for charcoal. 1066 - Norman Conquest. The Norman Kings wished to claim large areas of woodland for sport, and introduced the concept of Royal Forest. These designated areas included both wood, meadow and farmland. About 25% of England was brought under "Forest Law", with severe penalties for poaching the King's game. In the 12th Century the Royal Forests became means for raising money, though fines and other mechanisms. Nobilty could buy leases from the Crown to farm areas of the Forest. By the 16th Century English Kings had ambitions for national power and independence particularly against Catholic Spain. This demanded charcoal for iron, and timber for shipbuilding. 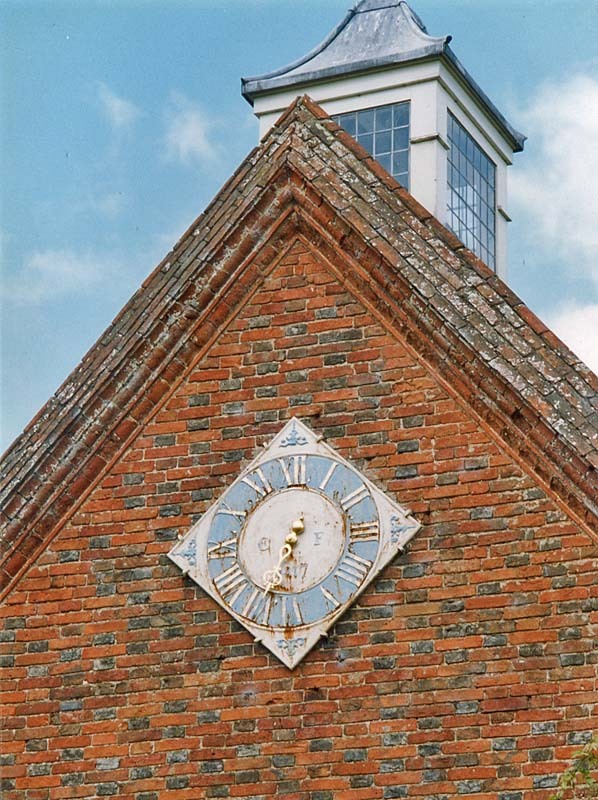 The tanning of leather required the use of oak bark, which was another major demand specifically for oak. Large areas of forest were sold to enterprising nobility. A third of the entire Forest of Dean was felled in one year. 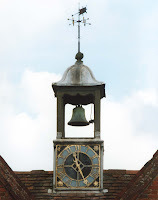 The 17th Century marked England's rise as a seafaring nation. 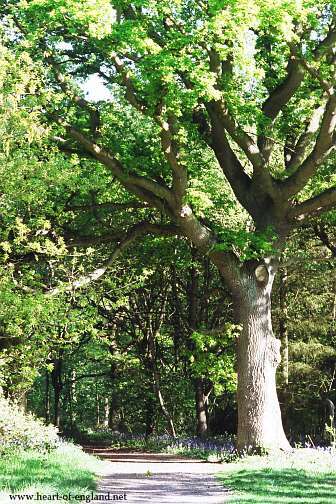 To build a single large warship required 2,000 mature oaks. Only 12% of England remained wooded, and declining woodland became cause for concern. 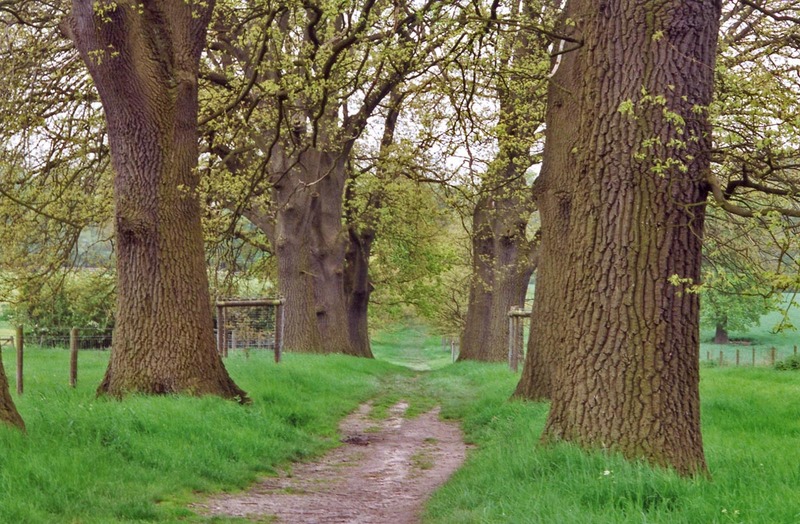 Within 80 years the number of oaks in Sherwood Forest alone had dwindled from 23,000 to 1,300. 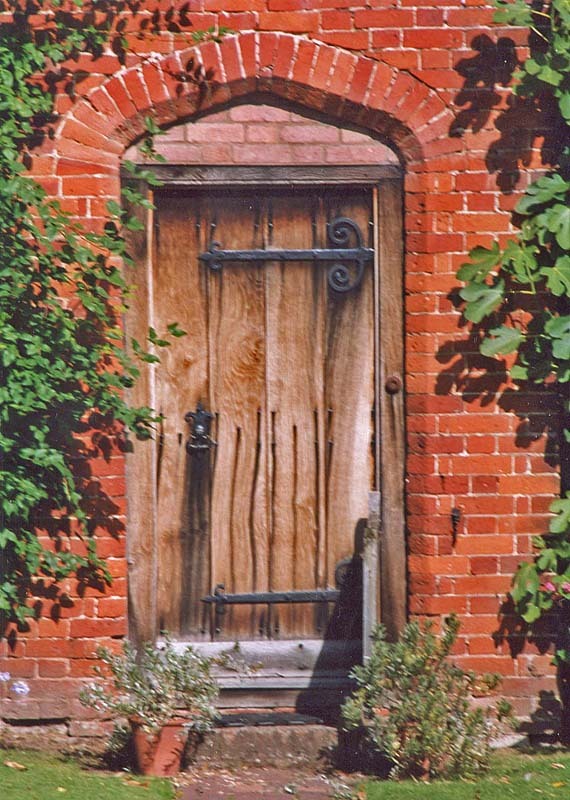 By the 18th Century there was a shortage of naval timber, and the start of programs to plant new forest. By the end of the 18th Century several millions of new trees had been planted. The Stagecoach 16 bus service provides a convenient way for visitors to Stratford to visit Warwick Castle, Kenilworth Castle and Coventry (and for visitors to Coventry and Warwick University to visit Stratford). 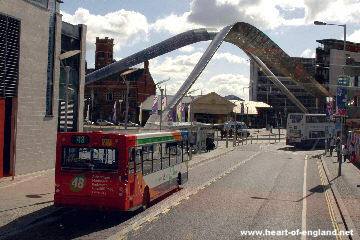 This picture shows the Service 16 bus at its departure point in Wood Street, Stratford. (The bus may often be a single-decker bus). All the remaining pictures on this page were taken from the top of the bus. 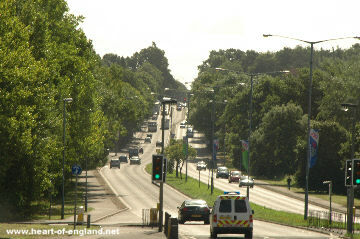 This is the A439, Warwick Road, as it leaves Stratford. The countryside is flat and open here (this was called the Feldon). It becomes more wooded as we get North of Kenilworth (the Arden). The photo above is taken near Snitterfield, the childhood home of John Shakespeare, Shakespeare's father. But the 16 bus does not pass through Snitterfield itself. 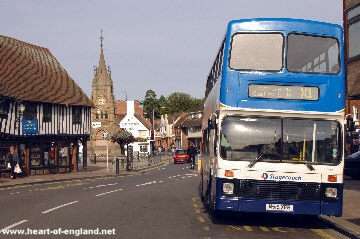 If you want to visit Snitterfield, then you would need to catch a different, less frequent, local bus service. 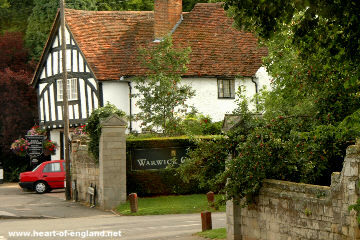 Approaching Warwick, along the A46, near Coplow Hill, there is a good view of the town straight ahead. 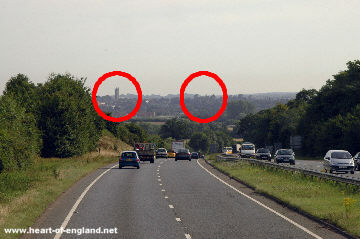 You can very easily see St Mary's Church, Warwick. 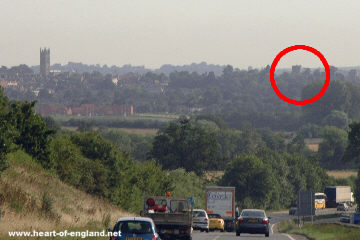 The towers of Warwick Castle are just visible, but these are largely obscured by trees. The tower of St Mary's Church is much higher than the towers of Warwick Castle. Before we reach Warwick, we need to cross the Longbridge Island. 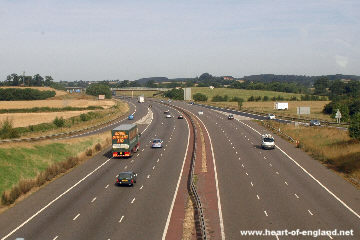 The M40 Motorway, which links London with Birmingham. 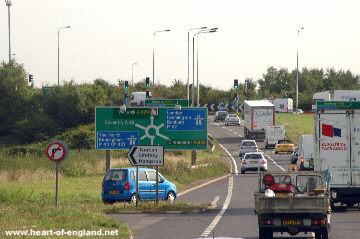 The A46, which links Stratford to Coventry. 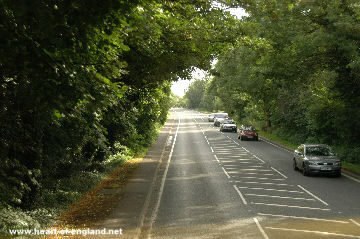 The A429, which links Warwick to Cirencester and the Fosse Way. This is a view looking along the M40 towards Birmingham, taken from the bus as it passes over the flyover at the Longbridge Island. 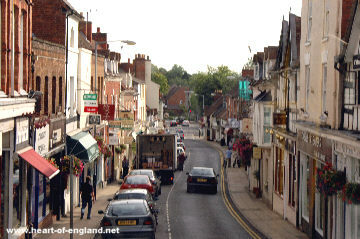 Coming into Warwick, this is West Street. 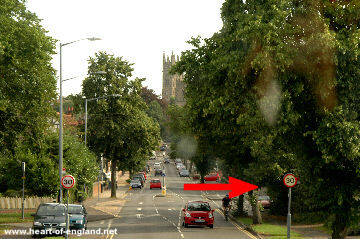 The main entrance for cars to Warwick Castle is indicated by the red arrow. It isn't very well signposted. If you are on the bus, then there are also alternative entrances for pestestrians further around the castle. We pass by the main car entrance to Warwick Castle. You can't see anything of the castle towers from any part of the bus ride (except the view from Coplow Hill). The tall stone building at the top of the hill is West Gate, one of the gates around the old town. There's also an East Gate, on the opposite side of the town, which the bus will pass by. And there was a North Gate, which no longer exists. 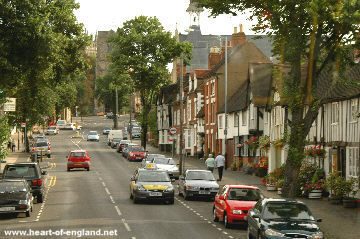 The centre of Warwick consists of some narrow and winding streets, on top of a small hill. The bus makes it's way, tortuously, to the small bus station. This is the market square. 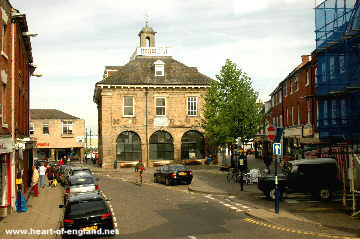 The building in the centre of the picture is the former Market Hall, which is now used to house the Warwickshire County Museum. The bus station is just round the corner. The bus may wait for several minutes at the bus station. 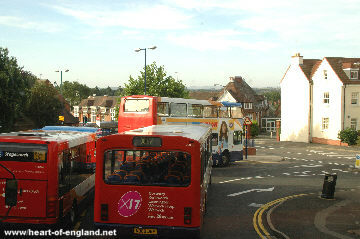 Leaving the bus station, the bus passes around the hillside, and passes the end of Northgate Street. 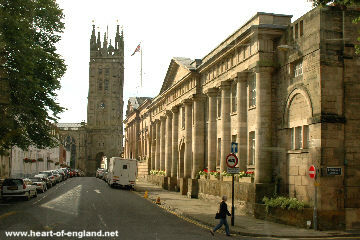 Looking up Northgate Street, we can catch a brief glimpse of St Mary's Church, and The Shire Hall (County Council administrative offices). The bus leaves Warwick along Smith Street. At the bottom of Smith Street the bus turns left. This is where Warwick railway station is. There is a bus stop outside the railway station. 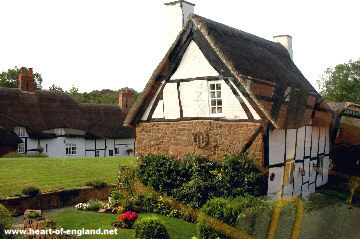 On its way to Kenilworth, passing through the small village of Leek Wootton, mid-way between Warwick and Kenilworth. There are a number of thatched cottages in this village, which the bus passes very swiftly. 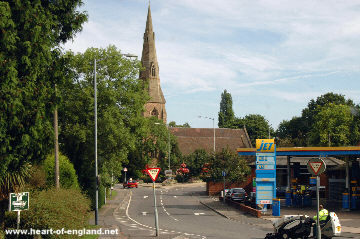 Coming into Kenilworth, we first see St John's Church. Kenilworth has a long straight main street, called Warwick Road. 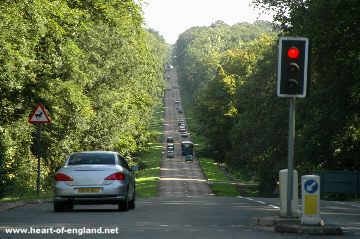 This is a view looking down the length of Warwick Road. 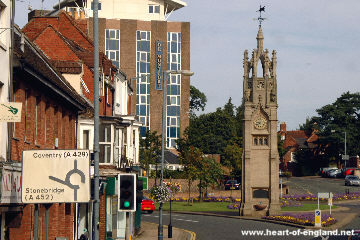 At the far end of Warwick Road is Kenilworth Clock. The bus travels up the road at the right, and then does a right left. Kenilworth Clock, shown in the picture, is point to get off for Kenilworth Castle. Service 16 only goes through Kenilworth town centre, so there is a short walk to the castle. Walk up the road on the right, and then take the left turn, or walk through the park, to the castle. 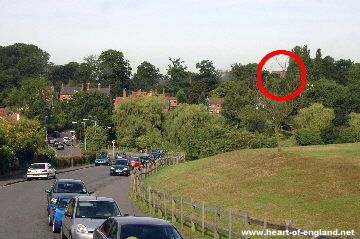 The tops of the stonework of Kenilworth Castle can just be seen over the trees (red circle). At this point you can walk along the road, or through the park ahead (at the right in the picture). 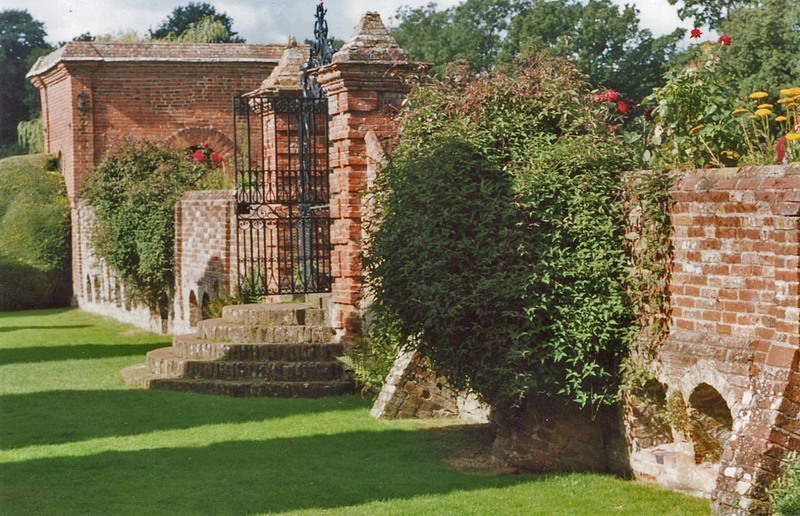 The park is known as the Abbey Fields, and the contains the remains of Kenilworth Priory. This is known as Kenilworth Ford. At times of very heavy rain, perhaps once or twice a year, the road can come under several inches of water. Just a small puddle is visible in this picture. The entrance to the castle is just on the left, exactly at the spot where I was standing to take this photo. Following this road a bit further and bearing right, is a tea shop and a public house. 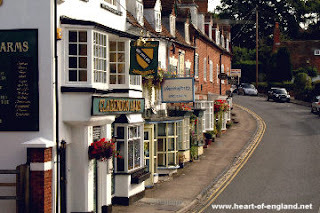 Directly opposite the pub and the tea shop, is a small village of half-timbered thatched cottages. This hamlet is known as Little Virginia. Resuming the service 16 route, and leaving Kenilworth, there are a couple of miles of open countryside between Kenilworth and Coventry. 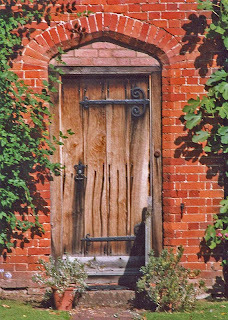 The countryside here has a different character from the countryside around Stratford. This is the region of the old Forest of Arden. Although the forest was clear long ago, this area still has a wooded feel to it. 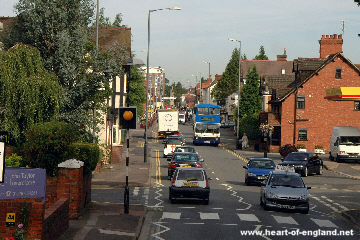 This is a view of the approach to Coventry along the Kenilworth Road. 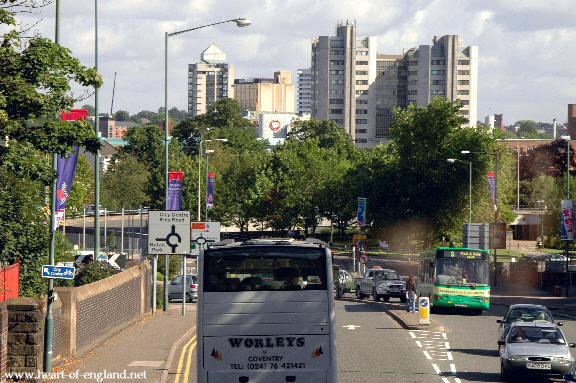 The bus doesn't go directly into Coventry but takes a short detour through the the University of Warwick. This picture is taken with the bus, stopped at a cross roads, at the top of Gibbet Hill. 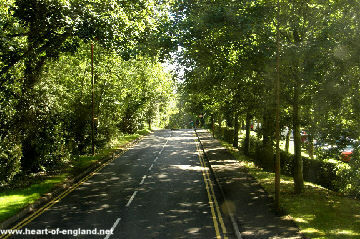 The bus turns left here, along Gigget Hill Road, which runs through the University of Warwick. 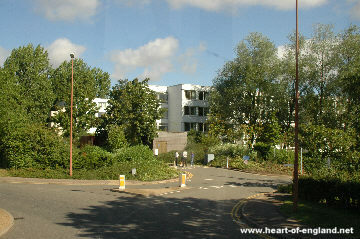 Student Halls of Residence, and numerous teaching buildings, are visible through the trees, on both sides of the road. Gibbet Hill Road, as it runs through the University campus. The bus makes a complete circuit around the University campus. 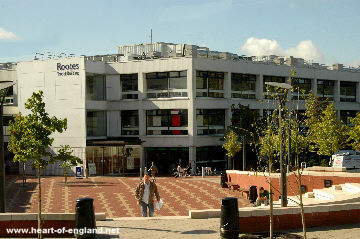 On the left is Rootes Hall, the University students' social centre. These pictures are all taken from the top of the bus. 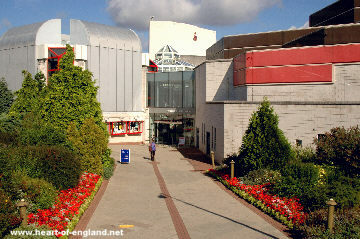 On the right, directly opposite Rootes Hall, is Warwick Arts Centre. 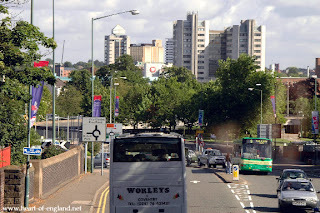 Leaving the University, the bus travels along the A45 to Coventry. 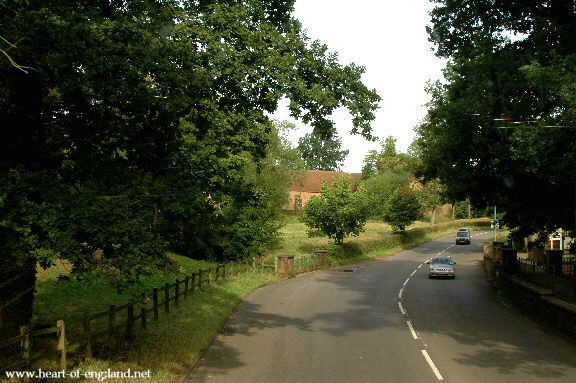 Before the M40 or M1 were built, the A45 was the main road between London and Birmingham. 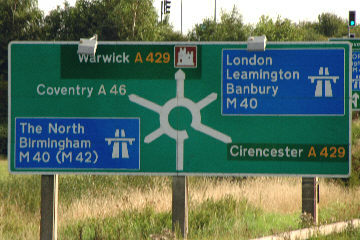 The A45/M45 joins the M1 near Rugby, and still provides an alternative route to London. Approaching Coventry along the A429, the road passes over a bridge over the London to Birmingham railway line, and Coventry station. 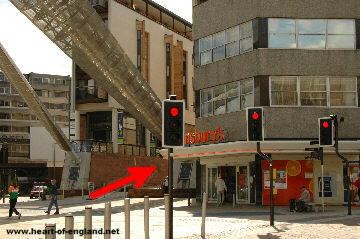 There is a bus stop on the bridge which provides convenient access to and from the station. There is train service between here and London, every 30 minutes, and the journey to London takes 70 minutes. 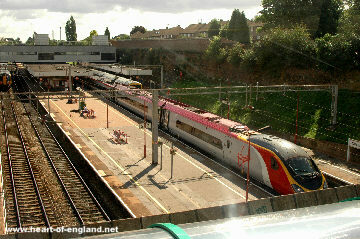 There is a Virgin express from London in the station in this picture. 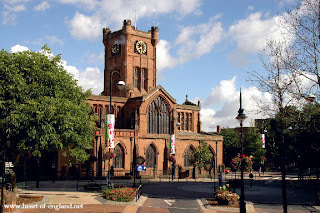 On the left we pass the church of St John the Baptist, in Corporation Street. Approaching Millennium Place and the Whittle Arch, where the journey terminates. 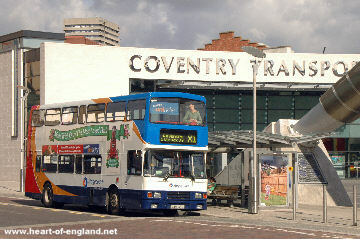 The bus at its Coventry arrival/departure point, which is outside the Coventry Transport Museum. The most direct route to the Old and New Cathedrals is up an alley way, just opposite where the bus stops. Up the alley way, the red brick building is the building that was built over the foundations of the medieval priory. At ground level (to the left and just out of the picture) there is a large window where you can look down onto what remains of the old foundations. 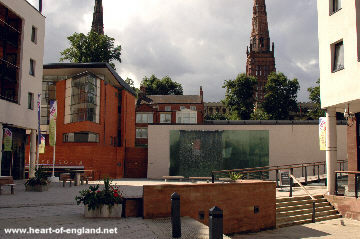 The walkway on the right leads to the visitors centre and to the New Cathedral.